UE’s organizing plan, as adopted by the convention, commits the union to an aggressive organizing plan which primarily uses “traditional” organizing through National Labor Relations Board (NLRB) to increase our membership and develop greater organizing capacity. This plan is based on an assessment that during this period of relatively low unemployment and rising expectations, traditional NLRB campaigns are likely to be fruitful in increasing UE’s ranks. However, as many speakers at the North Carolina meeting made clear, the “Wagner Act” model of trade unionism (named for the bill that created the NLRB) is not the prescription for increasing union density and power over the long term. Retired Unifor Director of Strategic Planning Fred Wilson opened the meeting by emphasizing that the labor movement has not responded adequately to economic and social changes, which has led to declining union density and power. An increasing number of jobs are in workplaces that are either difficult or impossible to bring under collective bargaining agreements, and many workers do not believe that unions are relevant to their lives. The labor movement no longer has the relationship to the working class, and society, that it once had. This is the problem that Unifor, and the North American Solidarity Project, were created to address. The first presentation was from former UE Director of Organization Ed Bruno. He reviewed the dim prospects for rebuilding union power through the NLRB. “We organize under a regime where workers have to be certified by NLRB,” he said, and “almost no workers use that procedure any more because it has been eroded by instant hostility from employers and the courts.” In fact, less than one tenth of one percent of eligible private-sector workers are even participating in NLRB elections. Last year in North Carolina, which is the ninth-largest state by population, only six NLRB elections were held, bringing union organization to a mere 312 workers. “When you have an absolute denial of rights, you can’t tinker around with the procedure,” stated Bruno, adding “we have never established new rights by legislating them, we have always established them through struggle,” with legislative recognition following, not preceding, action by workers and communities. This is true, he said, not only of the labor movement but of other social movements, including the civil rights movement, the women’s movement and the movement for LGBTQ+ rights. One element that Bruno suggested is critical for the success of the kind of struggles that can establish (or re-establish) rights is the formation of a committed core of workers in strategic workplaces that make a long-term commitment to organizing and to each other. Whether these groups develop a “pre-majority” union with dues paying members or whether they just continually look to agitate around issues until a majority can be developed, this committed core needs to be engaged in activities to further the idea that collective action and solidarity are the only road to improving conditions for workers. The presentations from UE Local 150 illustrated this theory in practice. Local 150 is a “pre-majority” union, where workers pay dues even though they are not covered by a collective bargaining agreement, and have not achieved majority representation. Local 150 Vice President Darrion Smith reported about the work of Local 150 in representing workers in the state’s Department of Health and Human Services (DHHS) without a collective bargaining agreement. Although Local 150 does not have a contract, they have established “meet and confer” meetings with the DHHS director, in which Smith and other Local 150 leaders can present grievances, suggest changes in policy, or make the case for why workers need a raise. Since DHHS is a state entity, the local also engages in political action to further state workers’ interests. Jim Wrenn of the CDC Workers Unity Committee, part of Local 150’s chapter for auto, aerospace and machine workers, described how a committed core of workers at Cummins Rocky Mountain Engine Plant (formerly known as CDC) have built an effective union in the plant despite not having majority support. The Workers Unity Committee grew out of a successful eight-month struggle in 1990 to win MLK Day as a holiday. Now, the union has “a constant practice of engaging workers through petitions,” and is regularly able to get one-third or more of the plant workers to join the union’s petition campaigns, which often win victories. Wrenn identified three key elements of the Workers Unity Committee’s success: regular petition campaigns that offer workers a way to participate in struggle; the “Unity News” newsletter which keeps workers informed of union activities and tells the story of how those activities win concrete victories; and the involvement of community allies. Unifor’s National Representative for Community Chapters, Roxanne Dubois, described this area of Unifor’s work. The community chapters seek to support workers who want to organize, increase overall Unifor membership, provide workers excluded from traditional collective bargaining opportunity to join the union, redefine how Canadian workers see and understand unions, and increase Unifor’s public credibility as a force for all workers. Unifor’s community chapters are based on the principle of collective action; forming a chapter is more than just an individual decision. Forming a community chapter requires a critical mass of workers with a common situation or common interest, a plan of action (which the union helps them develop), and a link with a Unifor local union. Members of the community chapter attend meetings, and can participate in the local union’s activities, although they do not elect members of bargaining committees or vote on contracts or strikes. Dubois gave examples of several Unifor community chapters, including the Unifor Canadian Freelance Union, whose 250 members across the country are self-employed workers in the media and communications sector, and a community chapter in East Danforth (a neighborhood in Toronto) that organizes temporary workers, all of whom are women, to participate in campaigns relevant to their work lives like the fight for a $15 minimum wage. 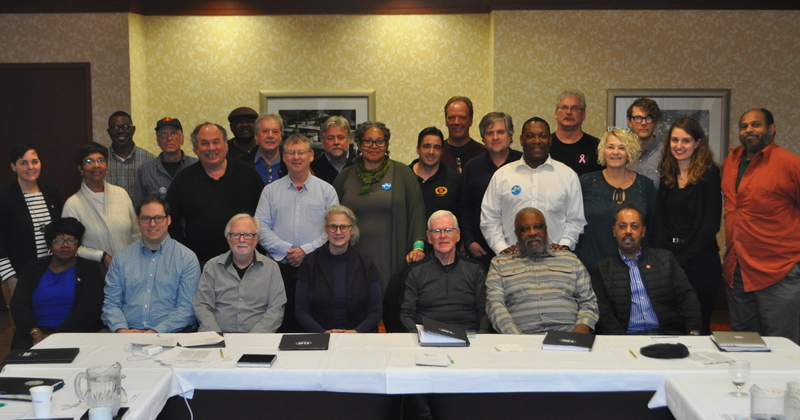 The consensus of the meeting was that organizations like UE Local 150 and the Unifor community chapters will be crucial in rebuilding unions’ relevance to and relationship with the working class as economic and social changes reshape the face of work. One in six new jobs created in the last decade in the U.S. are not covered by the existing collective bargaining laws. In Ontario, 87% of all workplaces have less than twenty employees, making them extremely hard to organize in the Wagner Act model of shop-by-shop organizing model used in both the U.S. and Canada. Large workplaces are increasingly “fissured workplaces,” with one employer that determines conditions for subcontractors but is not legally the employer of record. The working class is also increasingly non-white and female, making it ever more important for unions to embrace an equity agenda in order to be relevant to the lives of the workers we seek to organize. The meeting also offered an opportunity for UE and Unifor leaders to discuss ongoing joint work to demand corporate responsibility from General Electric. Unifor representative Maureen Dawson reported on the plant closing agreement that Unifor Local 524 at Peterborough, Ontario recently signed with the company, and retired Steelworkers strategic campaigner Joe Drexler and University of Montreal professor Gregor Murray offered their thoughts on successful worldwide corporate campaigns such as the one against mining giant Rio Tinto, which Drexler led. Unifor’s Wilson suggested that the campaign should focus on GE’s lack of commitment to the communities it operates in, such as Erie, PA. Drexler said that corporate campaigns are most likely to be successful when they find a “winning issue” that is “not just about the workers,” and also made some helpful suggestions for building relationships with IndustriALL, the global union federation which helped host the November meeting of GE unions in Geneva that led to the formation of the global GE Trade Union Network. The meeting was attended by all three of UE’s national officers: General President Peter Knowlton, Secretary-Treasurer Andrew Dinkelaker, and Director of Organization Gene Elk, as well as retired UE General President Bruce Klipple, and retired UE International Representative Carol Lambiase, who serve on the UE-Unifor Study Group. Also in attendance were Local 506 President Scott Slawson and executive board member Matt McCracken, Local 150 President Nathanette Mayo, retired UE International Representative Saladin Muhammad, Unifor Organizing Director John Aman, Mark Brooks from the Utility Workers Union of America, and national office staff from both UE and Unifor.